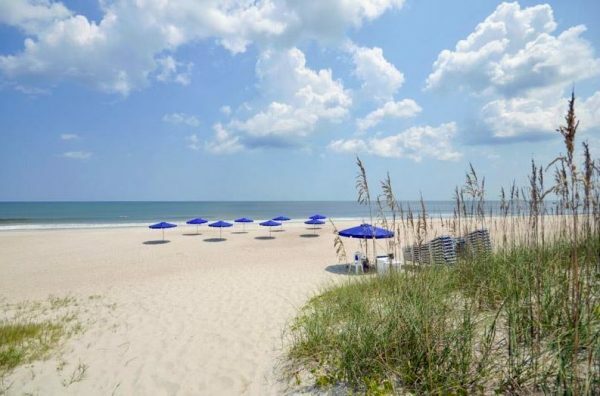 With a prime location near Main Beach, one of the top beach parks on Amelia Island, the Terraces at Beachside is a top tier condominium complex that offers affordable vacation rentals with stunning ocean views. The condos at the Terraces at Beachside are cost efficient yet open and spacious and can comfortably sleep up to 4 people. The complex is not too large as it has just a total of 15 units, so you’ll get to enjoy a great deal of privacy and much less noise than any hotel or other crowded lodging option. One of the top benefits of staying at the Terraces is the fact that you’ll be able to wake up to amazing and scenic views of the ocean. You’ll want to get up early for at least one of the incredible sunrises on the Atlantic that you can easily see from the master bedroom, the living room or the balcony. With plenty of windows in these modern and spacious units, you’ll get generous amounts of sunshine and will have the most beautiful ocean scenery backdrop around you while you enjoy your stay on Amelia Island. You’ll certainly get your money’s worth when you stay at any of the Terraces rentals with included features like a fully stocked kitchen for home cooking, fully furnished living room, flat screen televisions, fast WiFi internet, access to two beach cruiser bikes, large and modern bathrooms, washer and dryer, recently updated décor, bright vibrant interior designs, and large windows that allow the vibrant surrounding ocean scenery inside and make the condo cheery and uplifting every moment you’re there. There’s no question that this condominium complex is one of the best deals on Amelia Island with everything that is included, along with its absolutely perfect location. You probably made the trip to Amelia Island to enjoy the many outdoor activities and attractions that the island has to offer, and the Terraces is certainly the right place for that. You’ll be located right by Main Beach Park, which is one of the best beaches on Amelia Island with impressive facilities for families. Only 5 minutes west of you is downtown Fernandina Beach and all of its shops, boutiques, top tier restaurants, historic buildings, museums, art galleries, theatre productions, distilleries and bars, and much more. You’re truly in an ideal spot right by the beach and these attractions with an exclusive ocean view as the icing on the cake. The Terraces at Beachside are conveniently located near one of the top nature parks in all of Florida: Fort Clinch State Park. This large park covers over 1,400 acres on the north end of the island and offers you and your group several exciting outdoor recreation options to participate in. Try out your luck shell or shark tooth hunting or hike through winding trails of maritime hammocks and coastal grasslands while getting the opportunity to view a diverse array of wildlife. You’ll see dozens of species such as deer, racoons, tortoises, birds and many others, so there will be plenty of chances to take some amazing photographs! There’s no doubt that you and your group will have a blast on Amelia Island and reside in comfort and beauty when you stay at the Terraces at Beachside, so feel free to request more information about the available units on our website or call ERA Fernandina Beach Realty at (800)-741-4011 for booking.